With its whitewashed walls, red roof, maritime colours, dormer windows and cupola, Tadoussac Hotel calls to mind an earlier era. 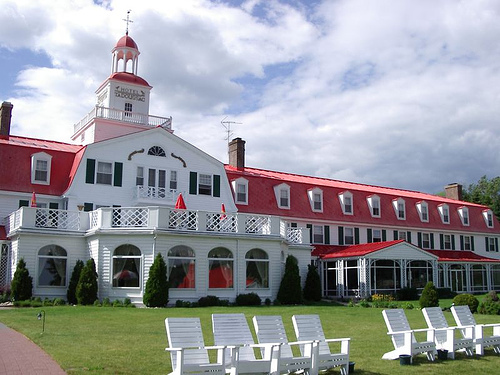 Overlooking Tadoussac Bay and the St. Lawrence River, the hotel is perfect for outdoor enthusiasts, family holidays, couples on a romantic getaway, or corporate groups looking to do some team building. Three hours from Quebec City, Tadoussac is a town rich in history, nature, and its diversity of activities. With fabulous whale watching, an abundance of marine life, impressive dunes surrounding the bay, and the landscape of the Saguenay Fjord, Tadoussac retains is natural untamed character. For thousands of years the whales have come to the St. Lawrence River spending the summer diving to the bottom of the river to feed on the rich marine life before migrating to the Atlantic Ocean in the fall. 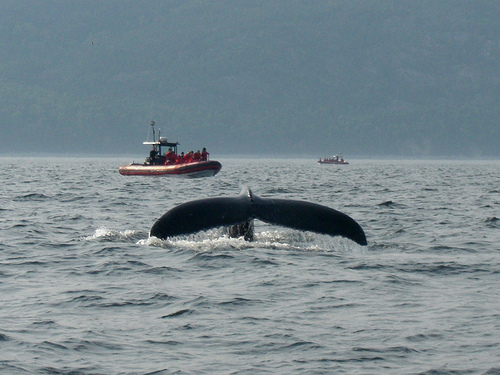 World Discovery include a 3 hour whale-watching excursion on their self-drive Inns of Québec itinerary, a comprehensive tour of this fascinating French-speaking province. A two night stay is included at the Hotel Tadoussac, although you may wish to stay longer in this lovely spot.